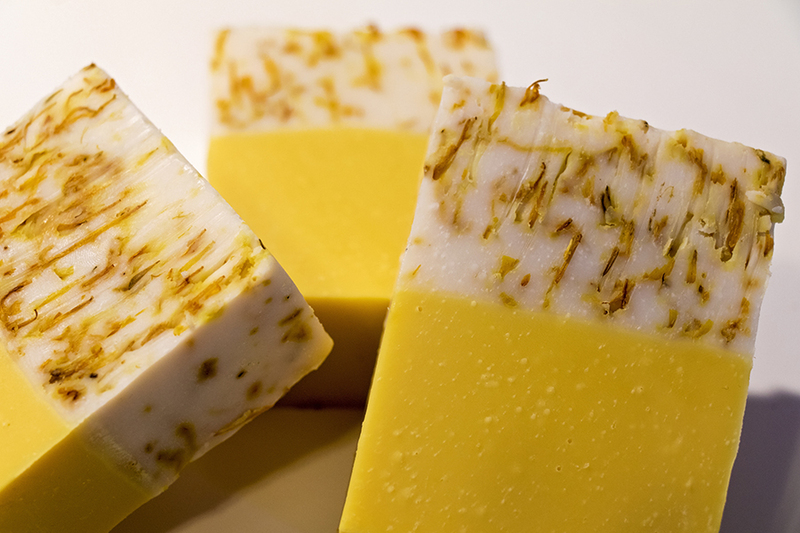 I finally got a break to make my second batch of soap — Sunshine Soap with calendula! But first, a note about my very first batch, that lavender soap I made a few weeks ago. 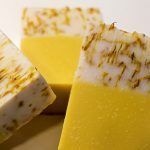 Cold process soap takes between four and eight weeks to fully cure, but it only takes about two weeks to fully saponify. The rest of that curing time is for it to evaporate as much water as possible, making the bar harder. The harder the bar of soap, the longer it will last in the shower. Since this soap is just for personal use, I decided to go ahead and break out a bar after the two week saponification, and let me just say, it’s amazing. It smells so good, I get a ton of lather off of it (even better than the body wash I typically use), and my skin feels so soft afterwards. Chris has been using it, too, and we have both agreed that we’re happy to use homemade soap from now on. No more spending absurd amounts of money on soap with chemicals and preservatives that I can’t even pronounce. But back to the sunshine soap! I think I’m going to like this soap even more. I’m not a huge fan of the lavender scent, and given that it’s a very relaxing scent, it’s not exactly ideal for using first thing in the morning. 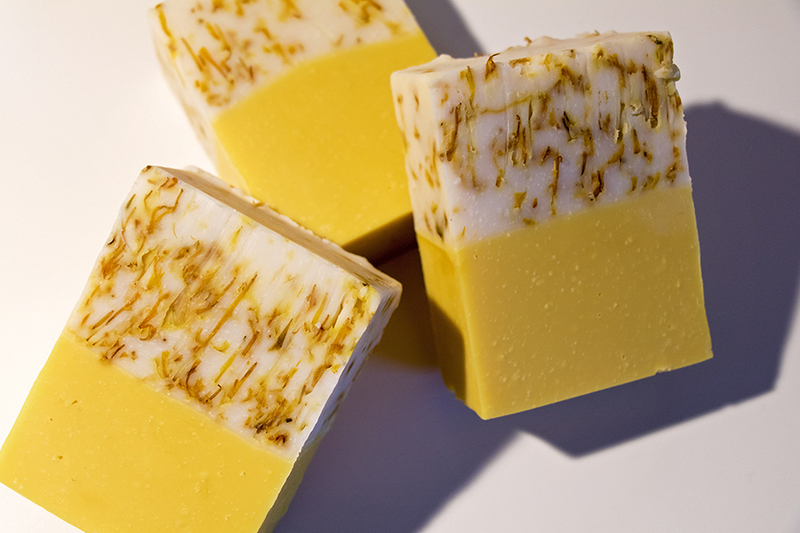 This sunshine soap, however, is scented with orange and yuzu. 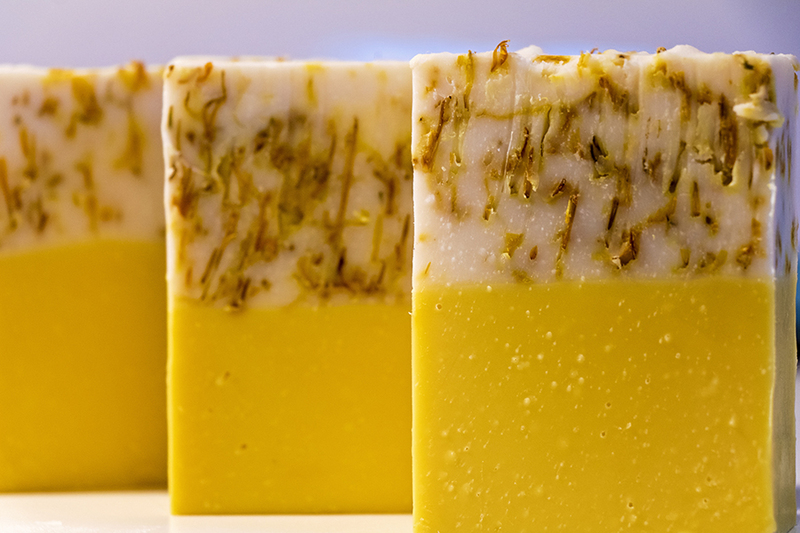 It’s a bright, sweet, citrus scent, perfect for perking you up in the morning. 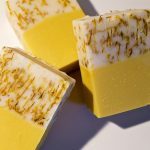 This soap also has the added benefit of calendula (dried marigold petals) that provide some gentle exfoliation in half the bar. This soap was slightly more advanced than the first batch I did, but I wouldn’t consider it difficult. It uses a vertical mold with a divider down the center. 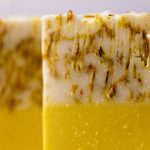 That allows you to split your batter into two, coloring each half separately (and in the case of this soap, adding the calendula to only one half), and pour each batter down one side of the divider. 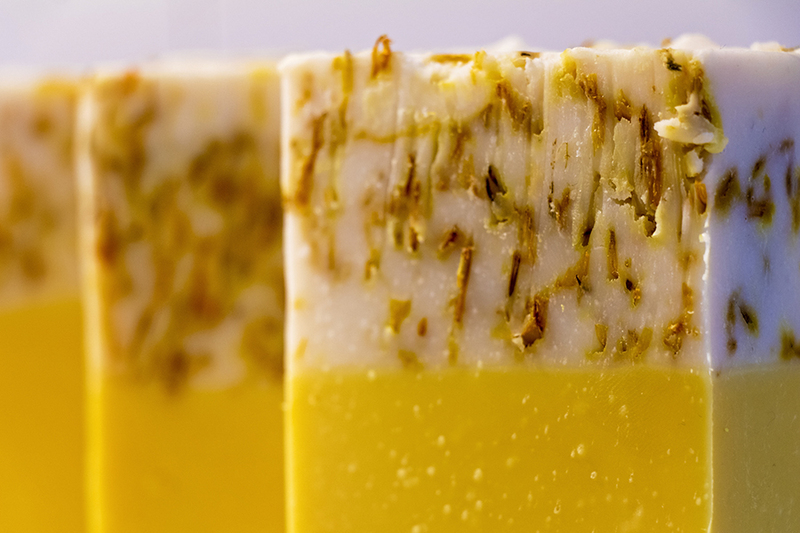 Once your mold is filled, you remove the divider and voila… a two layer loaf of soap! Just look how beautiful these turned out! As you’ll see in the video below, I also invested in a soap cutter. Specifically, the Bud Cutter from Bud’s Workshop, a storefront on Etsy. It’s really an awesome piece of equipment, and I’d seen it used in many other soapers’ videos. Bud uses guitar strings and guitar tuner knobs to tighten the string, and this thing cuts like butter! It allowed me to cut equal size bars of soap, something that will be important if I decide to start selling my goods later on. Plus, I got to support another crafter, which is always a bonus! All the ingredients for this soap (including the mold!) can be purchased as a “kit” from Brambleberry. I say kit in quotation marks because this one doesn’t actually come pre-measured. They just put all the individual ingredients in your shopping cart. You’ll still need to weigh out all the different oils and butter yourself. For the full recipe and measurements to fit this mold, you can check out the Soap Queen’s blog post and video on it. Now that I’ve got a couple of batches under my belt, I think I’m ready to try something original. 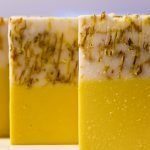 I spent some time this weekend writing my own recipe, using an online soap calculator. I’m planning to try a wine soap, where I replace the water in the recipe with wine, merlot specifically. 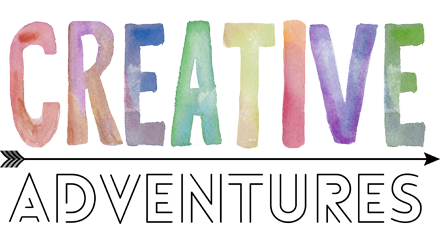 I’ve already ordered the colorants and fragrances, so as soon as that comes in, I’ll video the process and provide some info on how I wrote my recipe. As always, if you have questions about this video or have suggestions for future videos, let me know in the comments below. I’d love to hear from you!